The global biodegradable stents market features a fairly consolidated landscape with few prominent, multinational companies accounting for a behemoth share in the market. The three leading players—Biotronik, Boston Scientific Corporation, and Abbott Laboratories—account for a combined whopping share of 61.5% of the global market, finds Transparency Market Research (TMR). Relentless focus of these players to consolidate their presence by expanding to new geographic areas have largely enabled them maintain a stronghold in the market. Over the coming years, a number of prominent players are expected to spend profusely in research and development activities with an aim to bring innovative technologies and advanced products to the market. This also tends to intensify the competition in the market, observes TMR. The introduction of innovations in stent technology will be focused on serving the current and emerging healthcare needs better. Other top players include Terumo Europe NV., Sahajanand Medical Technologies, Elixir Medical Corporation, and Kyoto Medical Planning. 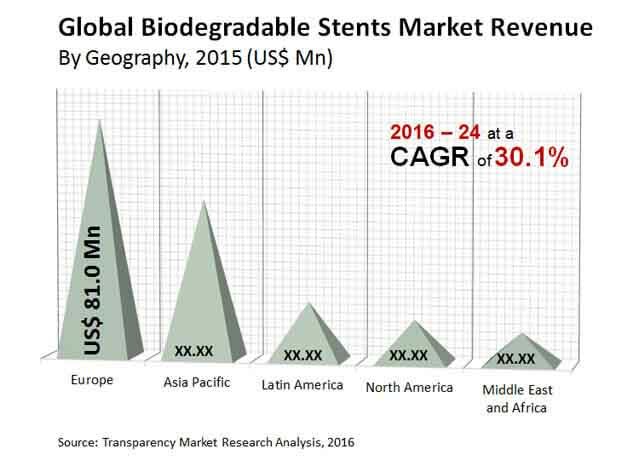 The global biodegradable stents market stood at US$18 million in 2015. Proliferating at a robust CAGR of 30.1% during 2016–2024, the global opportunities in the market is projected to reach a valuation of US$1.7 bn by 2024 end. The two primary types in the biodegradable stents market are peripheral artery stents and coronary artery stents. Of the two, the coronary artery stents holds the sway contributing the major share in 2015. The segment is expected to rise at a spectacular CAGR of 30.9% over the assessment period. The prominence can be attributed to the rapid rise in incidence of coronary artery disease (CAD) in various parts of the world. The key regional markets comprise Europe, North America, Asia Pacific, the Middle East and Africa, and Latin America. Of these, Europe accounted for the mammoth share in 2015 and in the coming years, which is expected to be increasingly led by Germany. During the forecast period, the regional market is projected to clock a striking CAGR of 27.2%. Biodegradable stents considered as a recent innovation and significant improvement over drug-eluting ones in stent technology has been experiencing attractive strides. The demand for biodegradable stents is driven primarily by their potentially beneficial applications in treating coronary artery diseases. The rising incidence of the disease and its marked mortality among worldwide populations is a noteworthy factor accentuating the market. The rising mortality of cardiovascular diseases in low- and middle- income countries and the growing prevalence of coronary heart diseases in elderly population world over are notable factors bolstering the demand for biodegradable stents as a potentially efficacious medical interventions. The wide preference for stenting procedures for treating coronary artery diseases is a key underpinning to the demand. Biodegradable stents are garnering wide popularity in the area of interventional cardiology, as they are safe, reduce complications, and can deliver more drugs at the site. In addition, their potential to reduce in-stent restenosis and other complications accounts for its attractive demand. However, compared to bare metal stents (BMS) and drug eluting stents (DES), biodegradable stents are expensive. Hence the affordability at large is a critical concern likely to cripple the growth of the market. The premium pricing of these stents may dampen their adoption among price sensitive consumers. Moreover, further research is required to address possible concerns of inflammation caused to patients and mechanical stability of the biodegradable materials used in these stents. Nonetheless, the biodegradable stents market is expected to get a robust boost by rising awareness about the advantages of biodegradable stents in developing and less developed regions and unceasing focus of players to introduce innovative products. Furthermore, industry efforts to bring biodegradable stents into the realm of mass affordability bodes well for the market.